Seqens Custom Specialties (previously Chemoxy International Ltd) attended the NEPIC (North East of England Process Safety Cluster) Annual Awards Dinner on Friday 18th January at Hardwick Hall. The annual event celebrates the outstanding achievements of the companies and individuals who make up the chemical-processing industries, in the North East of England. Congratulations to Emily Anderson from #TeamSeqens, for winning the prestigious Young Achiever Award 2019! Emily joined the Operations Team at Seqens in September 2018 as a Graduate Plant Manager and has welcomed various new opportunities. Currently Emily is completing her Training Programme to become Plant Manager, based at the Billingham site. 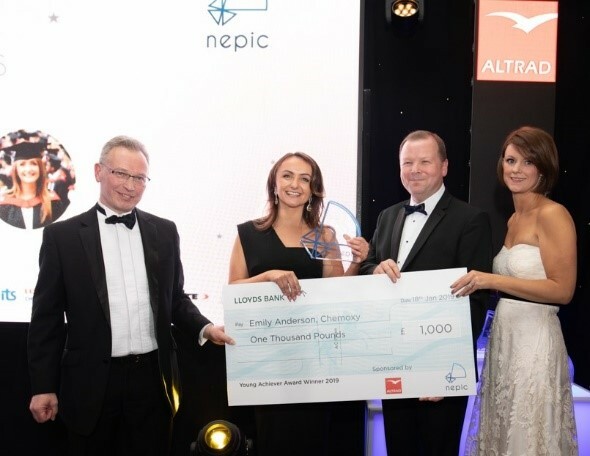 NEPIC, along with award sponsor Altrad, seeks not only to promote the industry as a career choice for those leaving school and University, but also to recognise the best and brightest young people already working within it.